Every time I bake some bread, it turns into a loaf, boule, braided or flat. I use to bake a lot of dinner rolls when the kids and in laws were living with us. 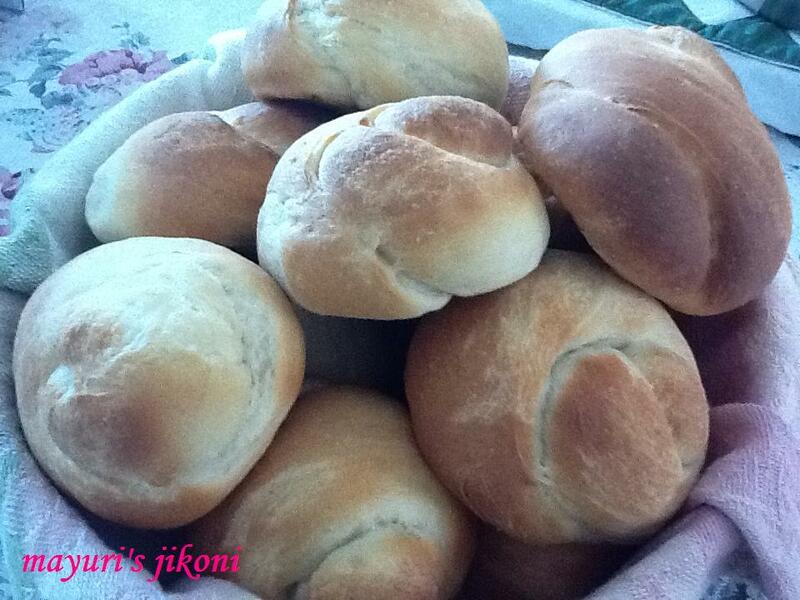 I decided to make some dinner rolls and simply loved the soft texture. Shape them as you like, just simple rolls or into oval shapes or into knots. Fun even for kids as they can later eat the shapes they have created. Make them with plain flour or wholemeal flour. Dinner rolls are good with soups, stew or as a lunch box idea. The number of rolls will entirely depend on the size of dough you use. I made about 12 rolls. As I have mentioned before, use bread flour if it is available in your area. In Kenya, the normal plain flour available is gluteny enough to bake breads. If you are using plain flour in India then you will have to add gluten as the flour is more for cookies and parathas. Sieve flour with salt into a large bowl. Add the instant yeast and sugar and mix it well. Add warm milk and form a dough. Knead the dough for 10 to 15 minutes till it is smooth and silky. If you are using the machine, let the dough knead for about 7 minutes. If need be add little extra flour if you are kneading the dough with your hands and the dough is too sticky. Grease the bowl with oil. Form the dough into a big ball. Rub oil over it and place it in the greased bowl. Cover the bowl with a cling film or plastic sheet and leave it in a warm place for about 2 hours to allow the dough to prove. Punch down the dough gently. Let it rest for 5 minutes. Grease baking trays lightly with oil. Using greased hands, divide the dough into the size of rolls you want. Shape the dough as you want. Place it on the greased tray. Let the rolls prove in a warm place for an hour. Place the rolls in the oven and bake for 20 mins till the tops are light golden brown. As soon as you remove the rolls from the oven, brush the tops with butter. Let them cool down a bit on a wire rack. If the rolls are small, it may take only 15 minutes to bake. Brush the rolls with milk or egg wash before baking. Check out the recipe for rosemary sunflower seed bread for kneading technique. Sprinkle sesame seeds, poppy seeds, sunflower seeds, flaxseeds, cumin seeds etc on top of each roll before baking. For burger buns,slightly roll out the piece of dough into a circle. Let it prove and then bake. If you are not using instant dry active yeast then you need to let the yeast activate first. Add the sugar in the warm liquid, stir and sprinkle the yeast on top. Cover the container and let it prove or activate for 10 minutes. The mixture should have become frothy. If it doesn’t then the yeast is not good. use this mixture to form the dough.